On January 5th, I helped make blocks for quilts our club is donating to Faith's Lodge, which is a retreat center in Wisconsin that specializes in ministering to parents who have lost a child or have a child seriously ill. We were able to finish enough blocks for 3 quilt tops. 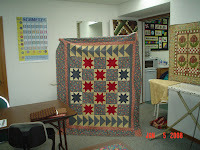 One of the ladies in my quilting club offered to quilt all three quilts. The pattern was designed by Lynette Jensen of Thimbleberries. It is called "Stars of Hope" and includes star, flying geese and plain square quilt blocks. These was a fun project and I was glad to be able to participate in it. If I see the finished quilts, I will try to take a photo of each of them and post later. I love it mom! Keep up the good work!